Reef 28 is a romantic retreat in the heart of all the action. Guest here won't miss a beat, they will be pampered with contemporary cuisine, enjoy a high-energy rooftop bar with evening DJs, and have access to all the amenities for fun and fitness. This property enjoys a privileged position just a stone's throw from Mamita's beach and footsteps away from 5th Avenue! Rooms at The Reef 28 are separated into two different categories, Junior Suites, and Master Suites. Both of which exude a boutique style and come with all the essentials you need for a relaxing, ultra-comfortable stay in the heart of downtown Playa del Carmen. In-suite amenities include complimentary high-speed Wi-Fi, a mini-bar, coffee machine, rainfall shower, personal safe, USB charging stations, 24-hour room service, and daily housekeeping. Prepare for an urban twist on drinks and dining at The Reef 28. With two restaurants, one lavish buffet, and three bars, there's always something deliciously imaginative on the menu. Get ready to savor the flavors of some of the most innovative cuisine in the Riviera Maya. For fresh Mexican and Asian flavors check out Cachito and El Asiatico. For breakfast, lunch, and dinner buffet check out Ventiocho's. Sip premium cocktails at La Cantina Del Mexcal, Lounge Bar 28, and Arriba, the stylish rooftop bar where you can also enjoy breakfast with a view. Soothe your soul and pamper your senses at The Reef 28 spa. Designed to fully indulge every guest you can find the relaxing oasis just steps away from Mamitas Beach Club. The spa offers a full range of massages and facials. 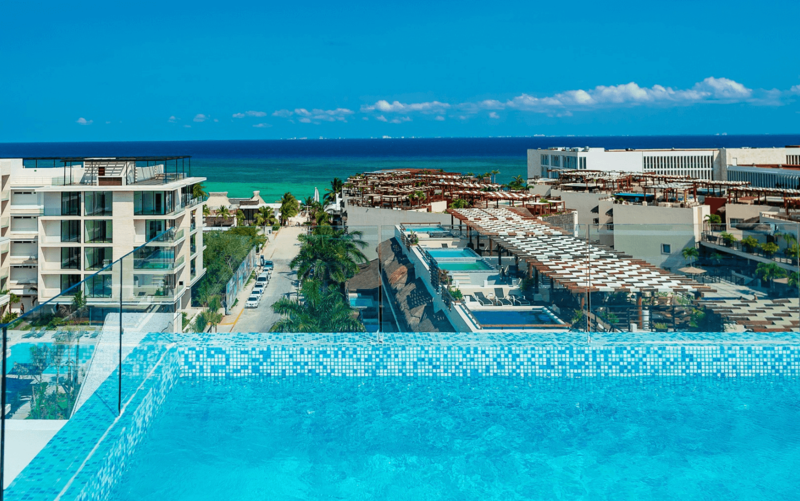 In addition, The Reef 28 guests may enjoy the facilities and full menu of spa services, including massages beneath tented cabanas on the beach, at Ya’ax Spa at The Reef Playacar and The Reef Coco Beach (the hotel's sister resorts). The Reef 28 proudly boasts all the amenities of a first-class business hotel. Host a welcome reception at the rooftop bar, get down to business in one of the meeting rooms and plan a teambuilding outing to nearby Chichen Itza. Whatever is on your agenda, the experienced meeting planners will ensure your event unfolds flawlessly. Plan a magical wedding at The Reef 28 Hotel. Our dedicated weddings team can help you make your dreams become a reality. Celebrate your love in paradise and create memories that last a lifetime. Learn more about having your destination wedding at The Reef 28 Hotel, contact us for weddings.